ABOVE: RER platforms at the railroad station (gare) in Terminal 2. The RER is a regional train network with stops at major railroad stations and Métro hubs in Paris. From the RER platforms at Charles de Gaulle Airport, you can reach the Gare du Nord, Châtelet-Les Halles, Saint-Michel, Luxembourg, and other stations of RER Line B. Connections to the Métro network and RER Line C (which runs along the left bank of the Seine) make it easy to get within 500 meters of any hotel in Paris, although you may want to take a taxi or shuttle instead of the Métro if you're burdened with luggage and arriving in the city center at rush hour. How to ride the RER: After you've retrieved your bags and gone through customs, look for a "Gare" sign with a train symbol. 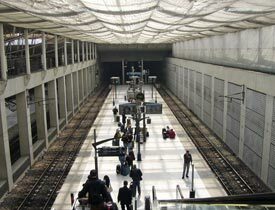 CDG has two RER stations: one for Terminals 1 and 3, and the other at Terminal 2. The terminals are connected by a free CDGVAL shuttle train. In 2019, the adult single fare between CDG and Paris is €11,40. Children under 4 travel free, and children from 4 through 9 years of age get a discount. The Paris Visite zones 1-5 travel pass for tourists ("Paris and Île de France") and the Navigo "all zones" weekly or monthly travel pass are valid for transportation to and from Charles de Gaulle Airport. You can buy either pass at any RER ticket window at CDG. Once you have your ticket, follow the signs to the platforms. When you've descended the escalator, check the electronic signboard for train departure times and platform numbers. Trains normally depart every 10 to 20 minutes between 5 a.m. and midnight, with an average travel time of about 30 minutes to the city center. If possible, take an express (direct) train, even if it means waiting a few minutes longer on the platform. Local trains stop at 10 suburban stations on their way into the city, adding 15 minutes or more to the normal 30-minute trip time. You'll have to stand during the trip into Paris if you're in the bicycle compartment, but you'll be out of other passengers' way and you'll find it easier to get off if the train gets crowded. Watch out for pickpockets, who prey on naive or jetlagged tourists. Allow plenty of time for journeys to the airport, just in case you're delayed or get lost in the terminals. High-speed TGV trains connect CDG with cities in France and neighboring countries. To plan your journey, visit Oui.sncf.